Workshop Sauniere Graphic works in France and abroad in a short time. You are a professional, contact us! 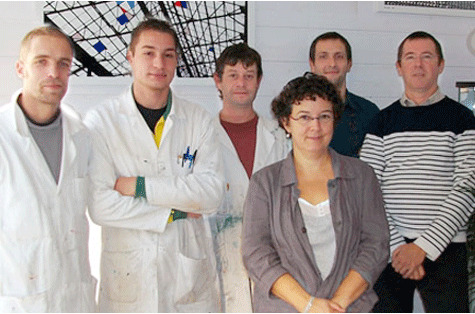 All employees of the company was formed alternately and graduated from the Ecole des Métiers de l'Imprimerie Nantes. A close relationship binds the company with EMI, Pierre Sauniere had been for 15 years a member of the Board of this organization. A turnover nonexistent reveals the spirit of the company: Jean-Claude, the latter having left the company, has retired after 39 years in our workshop. He had obviously trained several apprentices, who remained in the company and form and train future employees. A particular expertise for each of the labeling techniques combined with the spirit of initiative and variety of applications have several advantages: The employee versatility. The absence of monotony in the prints, which work more enjoyable workshop so effective. For the commercial and technical management part, Vincent Benzi, after a alternative learning of 2 years as sales engineer, is hired since September 2008. Since January 2014, he entered the capital of the company, reinforcing the sustainability the company by preparing a handover in time. The careers of Pierre Saunière (37 years in the graphic arts) and Vincent Benzi (training school of arts and graphic arts Estienne in Paris added by a technical and commercial training in screen printing), combined with a strong attraction and skill in Apple Environment and web development, allow knowledge about news related to our techniques, as well as recognition by the market players (customers and suppliers). Using an ERP developed internally ensures the effective management responsiveness to both commercial and production: quotations and works are managed optimally, to customer satisfaction as the workshop.